AP ICET Syllabus 2019 is available here for free download. Applicants who are preparing for the Andhra Pradesh Integrated Common Entrance Test can check APICET 2019 Syllabus & Exam Pattern. 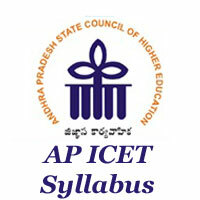 This Latest APSCHE ICET Syllabus 2019 is provided by the Sri Venkateswara University. Applicants can check the complete Syllabus of AP SCHE ICET 2019 Exam for both MBA & MCA Streams, Exam Dates, etc. from below sections. For other info, candidates can visit the official website that is sche.ap.gov.in. As there is a huge competition for APSCHE ICET Exam. Thus perfect preparation is very essential to get qualified for the APICET 2019 Exam. According to the APSCHE Schedule, APICET Exam for the Academic year 2019-19 is going to be conducted on 26th April 2019. If you are planning to attend AP ICET Common Entrance Test the first thing comes to mind is what will be the ICET Syllabus for the exam. So, now you may be in search of AP ICET Syllabus 2019. For the sake of the Candidates, Here on our site, we are providing the APICET 2019 Syllabus along with the Exam Pattern. Make use of this APSCHE ICET 2019 Syllabus and Prepare well for the AP MBA & MCA Entrance Exam. APICET is a State Level Entrance Test conducted by the Andhra Pradesh State Council for Higher Education (APSCHE), Andhra University. APSCHE conducts this Andhra Pradesh Integrated Common Entrance Test examination every year. This AP ICET is to check the candidate’s ability in the systematical thinking to provide admission into MBA/MCA Programmes offered by universities and Profesional Colleges situated in Andhra Pradesh. So, candidates who are seeking for admission into MBA & MCA Courses in Andhra Pradesh must Qualify in the ICET Exam. Applicants will get Admission based on their ICET Ranks which will be decided based on their Score in AP ICET Exam 2019. Along with the APICET Latest Syllabus, get an idea about the Exam Pattern will also help in the preparation of the Integrated Common Entrance Test. By checking the Test pattern for AP ICET Exam 2019 candidates can assess the No of Questions asked from different Subjects and weightage of each Subject. This APICET Exam emphasizes accuracy. The Exam Pattern provided here is the Updated AP ICET Test Pattern. Check this Pattern and Start your Preparation. Andhra Pradesh Integrated Common Entrance Test is an Objective Type Test consists of Multiple Choice Questions. AP ICET Exam consists of three Sections namely Section A, Section B & Section C.
Practising the Model Papers of Andhra Pradesh ICET Exam is very important. Because though you have prepared really well if you are unable to manage the time you may not attempt all the Questions in the Exam. So in these types of Entrance Tests, Time Management is very necessary. Hence Practicing Previous Papers makes you perform well in the Exam which clears your way for admission into your Favorite Course. So Practice as many Old Papers as you can before attending the Andhra Pradesh Integrated Common Entrance Exam. You can Download the AP ICET Previous Papers from the below link absolutely at free of Cost. Are outside state people are allowed to appear in ICET? When will you accept applications for apicet. i actually lost my registration ID of APICET 2018 so please suggest me how to get my rgistration ID so that i can have my admit card in future. is there any negative marking in ap icet exam? I already write icet exam in 2017.due to some of the reasons i didn’t study mca.now i want to study.may i know i am eligible to write the icet or not.